I spent a few days in my former home city, Toronto, to see friends including a Susanfriend who treated me to a day that began with lunch and a spot of shopping and segued into tapas and a dance performance. In other words, Girlfriend Heaven. I thought, This is the city where I worked for over 35 years, how on earth did I get dressed? The answer is the now-defunct bridge lines; Anne Klein's well-made separates, Holt Renfrew's (where I stroked the Gucci) elegant but relatively affordable house brand. But girlfriends wanted to shop, so Susan and I walked a few meters east from Holt's, but a good trek down the luxury scale, to Talbot's, the store another friend calls Forever47. I held out little hope, but the window advertised a 30% sale on tops, and I had a 40% off one item coupon. Though I initially turned up my nose as if in front of an overaged wedge of brie, Talbot's surprised me. After their scary fall/winter 2017 frill binge, the brand now offers more tailored, unembellished styles. A tweed blazer can accommodate American prep, French BCBG, and "I'll wear whatever I like, thank you" tastes, about as universally useful as it gets. Let's see how Talbot's do, compared with other vendors. 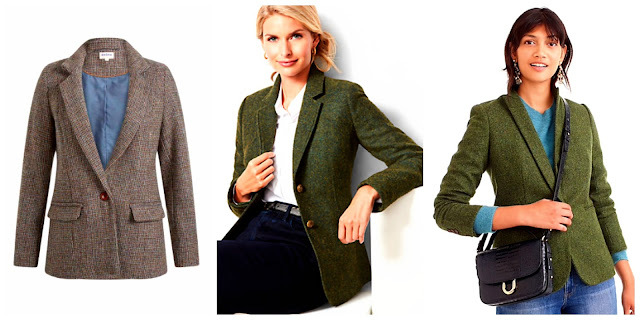 Left: Brora's Harris Tweed jacket, £449 (about $US 590 ), in pure wool tweed woven in the Hebrides. Impeccably classic and up for a lifetime of wear. in that 'what colour is this exactly' mix Brora-lovers crave. (It is called "Ocean & pine", but there are also bits of russet and grey, among other hues.) I've never met a Harris tweed that wasn't rough, which is part of its charm, but you decide. With the import duties and shipping, this is a significant purchase. Centre: Talbot's Shetland Aberdeen herringbone blazer, $US 169. The fabric is a blend of about half wool, plus poly and viscose. A Norfolk back, princess seams for shape, vents at cuffs and centre back: all the details are in place. The teacup print lining may not be your cuppa, but you might consider relining the body if you could pick this up on sale. Also in pink, indigo and a handsome houndstooth. Available in Misses, Petite, Misses Woman and Misses Petite. Right: J. Crew's Parke blazer in British-milled green Donegal tweed, very sharp but now s/o—and no specialty sizes. Sometimes they bring back a best-seller. Price, $US 230. Talbot's impressed me with its shaping; a little viscose and poly can soften wool, so it drapes better. With the 40% off one item coupon, this would have been a grabber had I wanted a blazer. The wool-averse might check out the velveteen version, $US 149. I was tempted by the Modern V-Neck in a cotton-modal-nylon mix, not too bulky under a jacket. 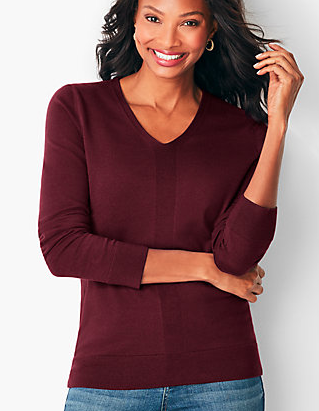 Shown in Merlot; regular price online is $US 79.50. 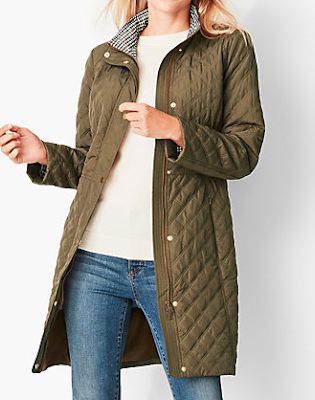 I cracked my 40% coupon for this quilted coat, regular price, $US 179. A good length, washable— and it saved me from hypothermia when the temps skidded into single (Celcius) digits that evening. Colour is a bit deeper than this shot, more olive than khaki. You still have to pick and choose at Talbot's; maybe the "turned-around" in the post's title is a bit enthusiastic. (I love Corgis, though not on my chest.) But finally someone there has a hand on the grown-woman wheel. This is not MaxMara, but a soft black leather pencil skirt in an adult length (Misses is 24 inches) was one-third the price and looked smashing. And let's talk about how it feels to shop: no one acknowledged me in Holt's, though the floor was all but empty on 11 a.m. of the Friday of a long holiday weekend. At Talbot's, the staff were attentive, the dressing rooms spotless, well-lit, and fitted with built-in wide benches. I think I could live in one, if it had a shower. They gave Susan the 40% off one item—same as me, though she had no coupon—and suggested she register for a free points card to get another 10% off. Now that's service. Back on the street, women strode by in 4-inch heels the diameter of a chopstick, and trim Duchess-of-whatever fall coats. We had once been like them, running to catch the subway after work on Friday, buoyed by an extra day off (Canadian Thanksgiving). Now, we sauntered in sneakers. I was slightly abashed to carry the red Talbot's bag into the hip Bar Raval, but that's us, now. We laughed at ourselves, stowed the bags under our stools, and ordered glasses of sherry. I've been a limited Talbots shopper for quite a few years. Not a big shopper (I'm not the right Talbots shape) but they were good for classics. I remember quite fondly when the scarves were silk and the leather was from Italy. I do think the quality has diminished over time (skimpy T-shirt fabric for example) and wasn't happy to see all the embellished clothing and the ruffles. When I'm in the city, I do still try to check out what's available and sometimes get lucky. Forever 47 had me howling. Was not expecting that, but it sure brightened this grey fall day. I have just returned to full time employment and might need that green blazer. Thank you. Love your writing, as always. Lorne's Spadina for beautiful coats, made in Canada, and alterations. The Brora jacket should be duty free, we have CETA since 2017 and made in Europe is exempt now. Many people do not know about CETA including the websites. I'm in the middle of discussions with Landsend as they are still slapping 18% duty on flannel sheets made in Portugal and apparently I'm the first person who noticed. I bought my first Johnston's of Elgin cashmere last year and will never wear Talbots cashmere again. Once you put on a 3 ply Scottish, you can't go back. I'm switching to fewer pieces and better. 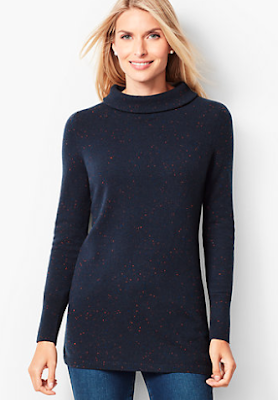 Talbots cashmere will shrink an entire size no matter if you hand wash it in cold water and block. I do like their vee necks as they fit well, the quality just can't compare to the real deal. I love your new coat; there was a beautiful red one but unfortunately it is only available in plus now - x plus (smaller than 1x) seems to be the same measurements as xl but the waist is oddly placed (too high). Admit I hadn't even looked at Talbots for the last couple of years as their styles became so strange with ruffles and infantile patterns. No denim jackets in deep colours there yet though. Mostly pastels, though there is a pretty lightish grey. Yes, there is far more money in Toronto; it is obvious. But I think very poor people are worse off there, as the minimum wage can't cover most rents and other basics and we have better daycare benefits. Not to mention NYC - many mainstream media in the US are focusing on the deepening income and wealth gap. VeraL: Thanks for mentioning CETA again, I think you did before and I could not find it. I am prepared to do battle for Brora. I agree Brora and Johnston's (same mill, Johnston's) cannot compare to Talbot's but find Talbot's good quality for the price. I have one Talbot's cashmere, at least 13 years old, and it has worn well and not shrunk. The one I tried on was better quality than I had seen in their stores in last several years. Three ply is too thick for me; I gave a very heavy Johnston's cashmere cabled sweater coat to a friend. I love Lorne's for coats, must have bought six there over the years, when I lived in TO. Leslie: Wow, that's a milestone! Best wishes. Kim: Yes, it is still a 'sometimes' thing, Since they were bought by a private equity firm the quality plunged. Still have those pleasing double-faced wools but you really have to winnow and not get caught up in "the best of the bunch" thinking as I sometimes do. lagatta: It is still not my favourite place but there can be gems if you look and the things are hard to assess online. VeraL: Even if duty free (and that would be a big help) will we still pay GST/HST? (I believe so but you are the expert.) And shipping. I am going to copy your note where I can save it and take on the vendor. Unfortunately I buy more French cashmere (but Eric Bompard manufactures in China) than Scottish. Good for you for fighting the sheet battle. I'm the shape for talbots, and a petite, which is so hard to find, but hated the ruffles. I was happy to buy a great black suit there last week. There still are some good finds among the too prep stuff. KPD: "Too prep stuff" is a very fair charge! What I call "golf course colours", but those can work...well, on a golf course. Happy to hear about your suit, as suits are getting hard to find, too, and often a store will have one piece in your size but not both, grrr. Truly I have a love/hate relationship with the place. 80% of my jeans are from Talbot's, just happen to fit me and wear well. Oh I so agree about Talbots last years ruffles! I actually complained to the sales associate who understood what I meant but what can you do? Also last years colours were just overwhelming and I like colour. I also have a "love/hate" relationship with the place as the quality is unreliable. Glad to know that this season may offer some gems. Since being retired I am careful with my fashion dollar as I want to be sure I wear what is in my closet for the life I have now and not for a fantasy retired life! I am also conscious that I am buying American and I try to support Canadian fashion when I can but it is not easy to find Canadian fashion that fits me and my budget. I will forever think of Talbots as Forever 47! and I am with you on buying Canadian. Here in Montréal, we have talented designers but many are making things for a younger market or clubwear. When I find something I can wear I thank them, and buy. I guess I’m not Talbot’s shape either and have had very limited success there. Last year I did get a blazer on clearance that fits with only minor alterations. I enjoy looking, but in a temperate climate Idon’t have much use for sweaters. I've been a Talbot's shopper for many years and I am very glad that they seem to have gotten over that whole "ruffle phase"! I've always relied on them for tailored yet feminine clothes and I've always loved their "Charming" cardigans. And at least I can afford their prices! It is getting very difficult in Toronto to find clothing in that mid-range - not H&M throw away fashion for stick figures and not astronomical designer prices! And I completely agree about the salespeople being very helpful and the dressing rooms - they are always spotless at that store and any other one I've been in. Contrast that with the Bay just across Yonge from this Talbots and you would have been shocked! Filthy, drab - terrible lighting and you have to search for a salesperson to unlock it for you! Wendy: I am curious, with a range from Misses through Woman and then Petite in both those ranges, why you believe you are not their size. Their range is among the very, very few with so many options. But I realize there are other things like the shoulder width or rise. (Like J. Crew, for me: the armholes are cut to be tight.) And, I saw women of so many shapes when i was in there. I have a friend who always liked my jeans but said Talbot's did not fit her, and then discovered she needed to buy Petite even though she is not usually a petite size, but she carries her height in her torso, not her legs. Anyway, just curious. Margie from Toronto: The Bay on Bloor is dispiriting and the Queen St. store only a half-notch better. (Then there is that confusing Saks/Bay mashup.) On Queen, most dressing rooms are open or it is easier to get one opened. But the stores are so huge, it is impossible to replicate the atmosphere of Talbot's or a small boutique. At one very high end boutique, I was conspicuously shadowed by a sales person who was obviously watching for theft. I almost said something •really• nasty but I guess thieves come in every stripe and I was not known to her. Still, you couldn't give me something from there after that. I also agree that there are limited options for the mid-range. One of my most well-dressed friends there solves the situation by shopping nearly completely at consignment. You'd be surprised how many women turn over their wardrobes every year. Margie, here in Montréal (I've been to the downtown and Anjou stores, as well as the oldest one in Old Québec) Simons has impeccable dressing rooms and toilets. Indeed this is no longer the case at the Bay; very sad as the large department stores used to have excellent facilities - do you remember "powder rooms"? Duchesse, another aspect of garments fitting is the extent to which they are cut "curvy" or more "straight" (bust-waist-hips ratio). Not using "curvy" as a euphemism for overweight... And as you say, wide or narrow shoulders. VeraL: Since your comment, I have been diving into CETA material. One site summarizing the terms says that to be exempt from duty the goods must be imported directly from Europe to Canada, so your Land's End sheets would not be covered.